Male. Taken at Abingdon, Oxon., on May 9th 2015. Male underside. Taken at Abingdon, Oxon on July 22nd 2013. Female. Taken at Bagley Wood, Oxon on April 23rd 2011. 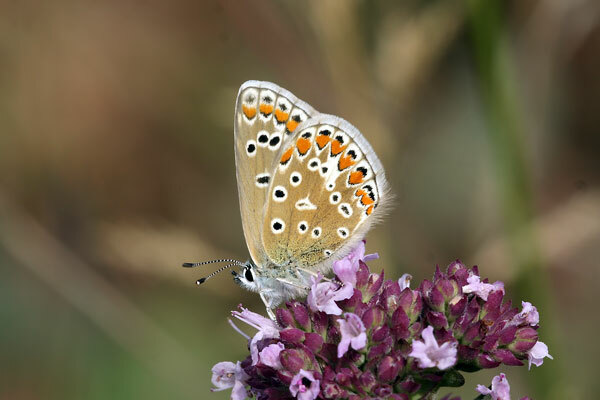 This butterfly is often seen in gardens, flying around shrubs in spring and again in summer. Both sexes have blue uppersides; females have black borders on both pairs of wings. In second-brood females the borders are wider. Both sexes have pale blue undersides with black dots. They usually keep their wings closed while at rest. 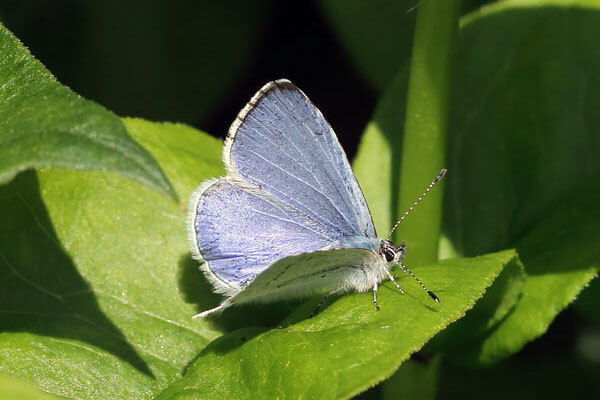 The Holly Blue is widespread in southern and central England, becoming more patchy in Wales and northern England. It can be found in woods and along hedges where there is plenty of Holly and Ivy nearby. It can also be found in churchyards, parks and gardens. There are typically two emergences each year, although there may be only one in the north, and sometimes a third one in the south in hot years. Adults from overwintering pupae can emerge as early as the first week of April, with the next generation emerging at the end of July, and the third (if present) in September. The main foodplants are Holly (in spring) and Ivy (in summer). Bramble, Dogwoods, Gorses, Snowberries and Spindle are also used. Adults feed primarily on Bramble, Bugle, Buttercups, Forget-me-not, Holly, Honeydew, Sap, Ivy, Privet, Thistles and Water Mint. This species is renowned for fluctuating wildly in numbers, forming a predictable cycle over a few years. This cycle is caused by parasitism by the wasp Listrodomus nycthemerus. The wasp lays its eggs in the larva of the Holly Blue, with a single adult wasp eventually emerging from the Holly Blue pupa.